Arvind Mahankali was barely five years old when he first set out to win at the Scripps National Spelling Bee, though of course, it took him about four years to actually make it there. Arvind first competed in the competition at the age of nine (he was eliminated on the word "Presa") and has returned every year since, eventually managing to place third. This year, he's headed to Scripps again only now the stakes are a little higher because, at 13, this is the last time he will be eligible to compete. The Daily Beast ran a sweet profile on Arvind, his family and all of his accomplishments (which include the time he hung out with and out-spelled Anderson Cooper). He amazed everybody except himself back in 2010, when he won his class bee and then his school bee and then the Queens bee and then became one of the two winners of the citywide bee. He had been just 9-years-old old, a true spelling phenom. "I didn't expect he would win," the father says. "He was studying hard but not like I imagine it should be." The father was speaking as someone who had been raised in India by very strict parents. "I thought I had to study 100 percent," the father, now a software engineer, recalls. "No TV at all." 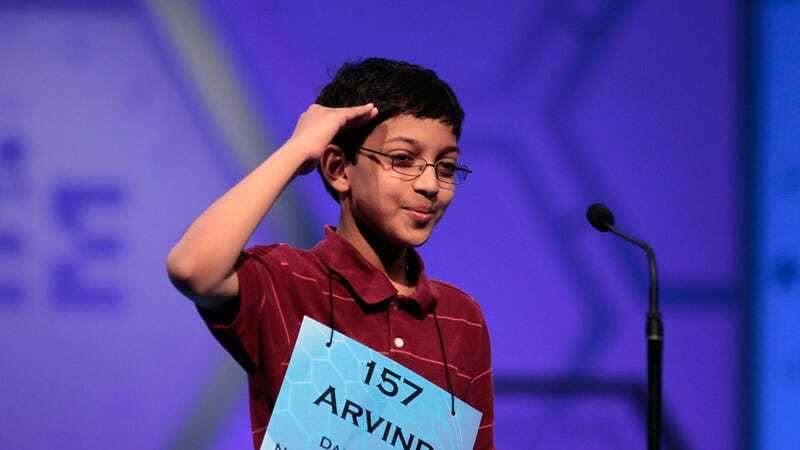 The American-born Arvind had discovered there were things he liked to watch in addition to spelling bees. "He said, ‘No, watching TV will not stop me,'" the father recalls. "He is so sure of himself." "No, watching TV will not stop me" should become all of our personal mottos. Arvind is certainly driven to succeeded. He began practicing spelling immediately after watching his first spelling bee as a small child and has carried his work ethic through to his teen years. While this year's Scripps might be his last to win, it's doubtful that a loss will break his stride (a loss isn't gonna slow him down — oh, no). "He wants to be a tennis pro," his father told the Daily Beast. "He thinks he can make a lot money that way." Aw, just like us, Arvind likes TV, sports and money. The only difference is that he can probably spell "renaissance" without first having to look it up.